I like being outside, but the cold and the snow even got to me today. I decided to spend the afternoon doing some crafty things rather than go out walking. 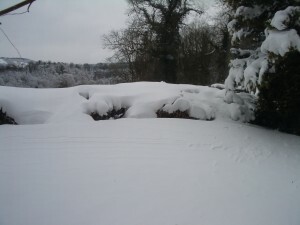 OH went out on his mountain bike but had to turn back because of snowdrifts. This is the view from my kitchen window – the snowdrift goes from the patio almost up to the top of the hedge. I posted yesterday about how I had picked up a patchwork book from the library for 50p. This afternoon I decided to have a go at making a block. 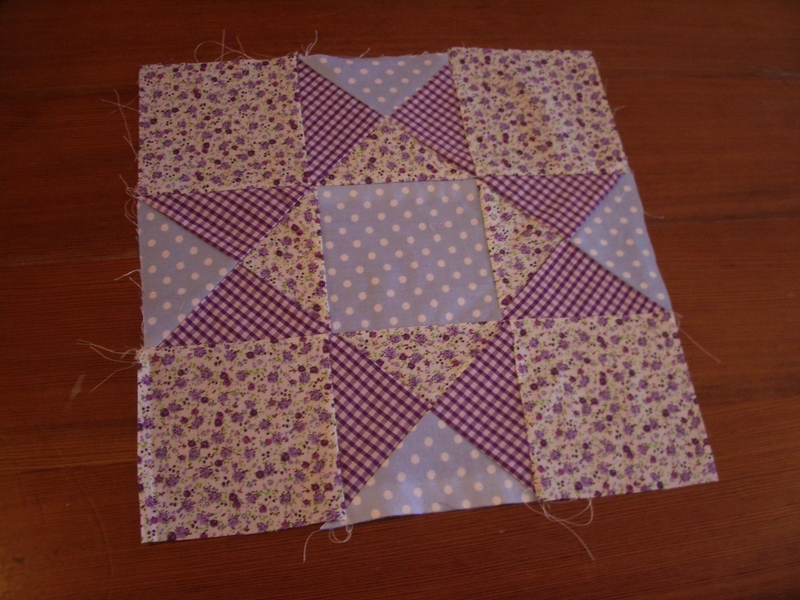 I’ve never done patchwork or quilting before – I really am a complete beginner. I spent ages drawing up templates on graph paper and then cutting them out from cardboard. Next I chose a block to try – in one of the library books I borrowed recently it’s called an Ohio star. I thought it would be fairly easy because it was all straight lines. I did have a bit of trouble with the quarter squares, and trying to get everything to line up was much harder than I expected – probably due to inaccuracy in cutting out the fabric. Here is my finished effort – imperfect, but I had a lot of fun making it. I really enjoy getting so lost in making things that time passes without me realising it. Have you ever tried patchwork or quilting? How did you get on? I’ve been quilting for about 18 years, self taught but have since done various workshops with really good quilters, and ended up doing city and guilds, doing a teaching certificate and ran workshops /adult ed classes you name it. AND I was TERRIBLE at sewing all my life until then. I HATED it! So there is always hope! And I think that piecing for your first effort is blummin’ good! Yes, youtube is brill for almost anything you want to learn – I learned how to crochet fro youtube. You go girl, quilting is a great pastime and relaxation as well as giving you something at the end of it. Your block looks great! Well done. I took up quilting this time last year. I’ve made one small panel and one single bed size quilt so far. I’m more scrappy and make it up as you go along than a pattern follower – far too slapdash for that! It’s a great hobby though, lovely to do while listening to the radio or watching the tv. There are loads of videos on YouTube, I’ve found them really useful, especially for binding my first quilt. There are lots of tips for easy ways to do things – like make triangles too.